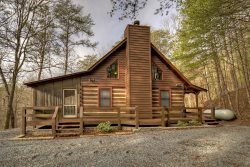 Escape to Honey`s Haven mountain retreat home located in the Blue Ridge Mountains for rest and relaxation. This cabin has been completely redecorated to provide a classic style to enjoy the inside of the home and has a large porch to enjoy views of the mountain range. The cabin has a master bedroom with a memory foam queen size bed to provide comfort and is set apart from the rest of the home by French doors to provide privacy from the outside world. The lower floor contains the living area with fireplace, dining area and kitchen. Two bedrooms are also located on this level. One bedroom contains a queen size bed and the other room includes a queen size log bed. The large porch has a bed swing and hot tub with a magnificent view of the valley and mountain ranges. It is wonderful to soak in the hot tub in the evening to watch the beautiful sunsets and stars in the sky. Also, enjoy playing games and cards on the large bed swing or just take a nap to replenish your soul. Walks in our Blue Ridge community bring lots of nature and variety of wildlife from deer, turkeys, and rabbits. Your spirit will be renewed.